Provide comfort for the family of Elsie Loney with a meaningful gesture of sympathy. Elsie Mae Loney, age 88, passed away peacefully on January 19, 2019. She was born in her family home on August 26, 1930 to Maurice and Marie (Vorick) Pontius in Kalamazoo. Elsie had a deep close relationship with God, praying every night with her rosary for all those close to her, as well as friends and people she hadn't met. Elsie loved her family and was always ready to help whenever needed. Her favorite activity was "heading up north" with her husband and family. There were several decades of family weekends and vacations up-a-north. She loved her pets (dogs and cats) and always helped raise the dozens of strays her kids brought home, including some with two legs. Her hobbies included crafting, watching old time TV reruns and listening to real country music sung by country "bad boys", especially Willie Nelson. She and Larry Loney were married over 50 years when he passed away in 2000. Elsie was also preceded in death by her daughter, Patty Minehart; sister, Rose Alger; brother, Maurice Pontius; brothers-in-law: Richard Loney and Bob Brown; and a sister-in-law, Rita Ann Green. She is survived by two children: Ann Austin and Larry (Suzanne) Loney; grandchildren: Tania Lamm, Nikki Smit, Renee Loney, Jennifer Walker, Brandy Dlugoss, Angie Pio, Sam Connie, Mary Minehart, and Bobbie Holliday; great-grandchildren: Amelia Loney, Navia Walker, Myah Walker, Chase Austin, Val Austin, Blake Paige, Seth Paige, Savannah Selders, and Aurora Holliday; as well as sisters-in-law: Edith Pontius, Mary Brown and Rosie Coy. Friends and relatives may meet with the family on Friday, January 25, 2019 at 10:00 am, with a memorial mass following at 11:00 am, at St. Ambrose Catholic Church, Delton, Rev. Fr. Francis Marotti, celebrant. Our thanks to the gentle, caring, helpful staff at Hospice Care of Southwest Michigan. Please make any memorial contributions to Hospice Care of Southwest Michigan. Please visit www.williamsgoresfuneral.com to share a memory or to leave a condolence for Elsie’s family. To send flowers in memory of Elsie M. Loney, please visit our Heartfelt Sympathies Store. We encourage you to share your most beloved memories of Elsie here, so that the family and other loved ones can always see it. You can upload cherished photographs, or share your favorite stories, and can even comment on those shared by others. 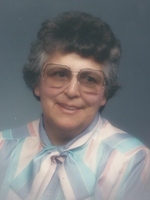 Provide comfort for the family of Elsie M. Loney by sending flowers. Spent a lot of time at Elsie and Larry's home as a kid. My Mother and Dad were friends and so us kids grew up together. I recall that Larry was usually gruff, but Elsie would have a way of smoothing it over. She was a very warm person with a big heart. I am so sorry to hear of her passing and I wish I had known in time to have attended her service. My sister Lynne and I were very fond of her.